Today's investment foundries use a wide variety of alloys. DAI offers ceramic core materials compatible with nearly all of these alloys including: Air Cast, Directional Solidified and Single Crystal. DAI manufactures all of its molded core and extruded core mixes in house to specified formulas and processing conditions to assure consistent results from green forming at DAI through casting at the foundry. Prior to being released for production use, all molded core materials go through a battery of tests to assure they meet exacting standards set by our engineering group. Key properties tested and evaluated include; particle size distribution (PSD), viscosity, binder concentration via loss on ignition (LOI), green shrinkage, fired shrinkage, modulus of rupture (MOR), density, porosity, thermal expansion, slump, Cristobalite, and trace element. Only materials that meet our internal specifications are released and used in production. Uniform properties and consistent dimensions in ceramic cores are important in the investment casting process. DAI's materials and controls guarantee the production of large numbers of cores with virtually identical properties from batch to batch. DAI uses two different forming processes; Injection molding and Extrusion to form all of its cores. Regardless of the process chosen, each is closely controlled via a network of standard operating procedures (SOP's) and departmental operating procedures (DOP's) to assure all cores are manufactured and processed using the same methods from run to run. This reduces both variation within the process and the chance of producing non-conforming cores. The firing process is another key step in the manufacturing process. Our computer controlled batch kilns assure that each batch of cores is fired to established time/temperature firing patterns. Temperature data from all runs is reviewed prior to releasing product for further processing to assure conditions throughout the kiln meet internally set standards. DAI puts all cores through precise inspection procedures at key phases of the manufacturing process in order to insure compliance to both internal and external specifications. We employ a combination of visual, radiographic, and various forms of contact and non-contact gauging techniques to assure conformance. 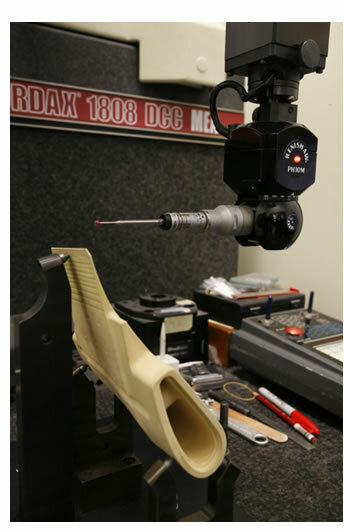 Examples of gauging methods available include; Laser, CMM, indicator (contact) type, go-no go, and optical. DAI works closely with each customer to create inspection methods and sampling plans that assure all CTQ parameters conform to customer supplied specifications.